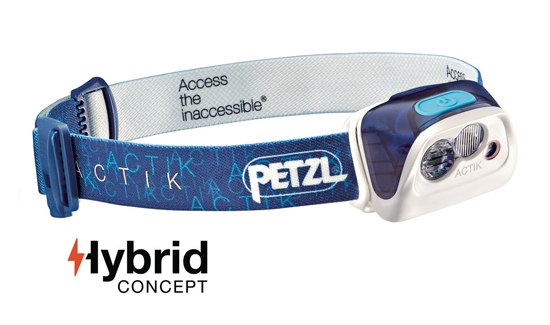 GideonTactical is excited to offer new Petzl headlamps in a wide, varied assortment of models and colors. Revered as innovators that utilize unique, constantly evolving technologies in order to continuously invent and design headlamps with superior levels of light output, Petzl has grown to become a trusted supplier of reliable, versatile illumination-based products. Their 30-plus years of experience are proof-positive that they can fully meet the needs of a wide array of customers, ranging from outdoor enthusiasts to hunters and everything in between. The compact, 150-lumen Tikkina headlamp is an ideal combination of simple, yet practical designs coupled with a long burn time. This hybrid headlamp is fully compatible with the core rechargeable battery – in addition to coming with three standard batteries – and has excellent proximity-lighting capabilities. Ideal for a number of stealth-based activities, such as hunting, fishing, or nature watching, the Tactikka features powerful, 250-lumen light output. It has a very long burn time along with excellent lighting versatility, which is due to its proximity lighting or focused lighting for movement. “The Tactikka offers many of the features of the more expensive headlamps at a lower price point, all while offering an impressive lumen output,” Brostrom said. With its 300-lumen mixed beam and multiple lighting modes, the powerful Actik is an excellent selection for any number of outdoor-based activities, including mountaineering, running, and hiking. Additionally, red lighting allows night vision, all while preventing it from blinding anyone else with you. Along with the Tikkina, the Tactikka and Actik are both now compatible with the rechargeable Core battery, which gives users greater flexibility in choosing power-source options. Make the unseen accessible. Check out these and other, new Petzl headlamps at GideonTactical.com.